Port Property Management is pleased to announce its very first SUPERSTAR TENANT! A resident at one of our downtown buildings since 2008…. She is blind in her left eye due to a car accident. She makes the best grilled cheese sandwiches! If Erin could visit anywhere in the world, she would totally go to Ireland. We appreciate your awesome-ness and look forward to having you stay a while! 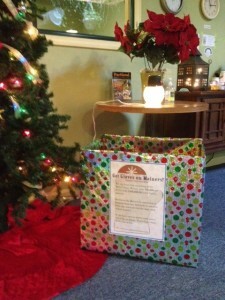 We are now featuring a drop box for the “Get Gloves on Mainers!” charity organization. So if you have any slightly warn or new gloves you’re willing to give to those in need, come on in to our office and donate today! Check out their official website here for more information. ALSO: Port Property Management will match the first 25 pairs we receive!!! Bring it on!!! PPM will be closed on Thursday, Nov. 28 and Friday, Nov. 29 for the holiday. We’ll be back on Monday at 8 am. Happy Thanksgiving and have a great weekend! PPM is excited to announce the addition of FREE wireless Internet to a few of its downtown buildings. 439 Congress Street (The Metropolitan) now has free wifi available to all residents of the building, as does 18 Casco Street (The Shepley). If you live in either of these building and would like to access the free wifi, please contact nicole@portpropmgt.com. 30 Preble Street (The Wadsworth) also has free wifi; if you haven’t already signed up, let us know. We’d love your feedback!! What’s the speed like? Are there dead spots in the building or your apartment? We want this to be a useful and valuable service ! Port Property will be closed on January 1st. HAPPY NEW YEAR FROM PPM! !